Coleraine fans pictured during last year's Irish Cup final. 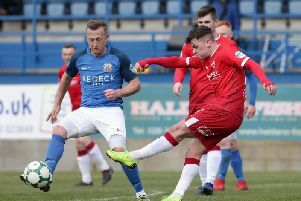 Coleraine Football Club have received an additional 1,000 tickets for the Tennent's Irish Cup final the club have confirmed. The tickets will be for the West Stand (Kop), which was initially not going to be used for the final on Saturday 5 May. However, due to the demand from Coleraine fans the IFA have agreed to open a section of the stand. "The Club have almost sold out the South and East Stands and as such, the IFA are going to open a section of the Kop (West Stand) for our supporters," a spokesperson for the Bannsiders confirmed. "Coleraine FC is to receive 1000 tickets for this stand and they will be on sale this Thursday evening in the club shop (6pm – 9pm) and during club shop hours until sold out." The club also clarified the situation with regards to the East Stand tickets after some confusion amongst fans. "We can confirm that this section has been allocated for our support. "Neutrals will be situated in a small section where the North Stand and East Stand joins. Ticketmaster will contact fans who have purchased in this area for further clarification." The club also thanked all the fans who have already purchased tickets.